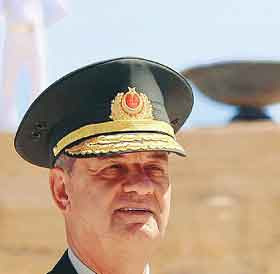 It is now official that Land Forces Commander Gen. İlker Başbuğ will become chief of the General Staff on Aug. 30 when Gen. Yaşar Büyükanıt is forced into retirement. While the latter 67-year old general reached the mandatory age of retirement, he had also gained a reputation for his compulsiveness. In contrast, Başbuğ is largely considered a "cool" general, but a military leader just as fervently secularist and tied to Atatürkist ideology as Büyükanıt. Başbuğ is likely to serve until 2010 and speculation is rife as to just how the new appointment will color military-AKP government relations. The appointment was ratified by President Gül after the annual meeting (held every August) of the Supreme Military Council (YAS), which meets to consider promotions and transfers. In a much more surprising happening of the YAS meeting, the generals did not decide to conduct its annual purge of of its officer corps. The purge has long been used to dismiss people who the military top brass thinks are ideologically-suspect (usually meaning Islamist). The military has long feared infiltration of its top ranks by political Islamists, and the annual YAS meeting has traditionally been an easy way to rid of unwanted officers without having to conduct open hearings. While the AKP government has protested these dismissals in recent years and argued that the dismissed officers should be tried in standard military courts, the absence of such a purge this year is largely being read as a conciliatory gesture toward the government. The Islamist press including Zaman and Vatan are also speculating that there might be a 'quid pro quo' arrangement between Başbuğ and Erdoğan: if Başbuğ does not dismiss top Islamists, Erdoğan will ensure that nobody at the top of the TSK will be pursued as part of the Ergenekon investigation. While doubtful, there is very little reason that has been made public as to why the YAS forewent what had become a sort of annual rite performed in the name of preserving the sanctity of the secular state. Could this be indicative of a new working relationship that is developing between AKP top brass and the TSK? If such a détente is indeed incipient, what are the conditions for its emergence? What new covenant might be in the process of negotiation and just what does it mean for Turkey's pursuit of EU membership (there are Euro-philes and Euro-skeptics in both camps)? What does it mean for human rights protections?